Although pre-made go kart frames are made available in local hobbyist stores, but not everyone has the ability to pay for these expensive babies. A basic model will rip a few thousands off your wallet. If you like go carting and you are planning to get your first go kart, why not consider making one yourself? It costs relatively cheaper and the outcome product, ideas and design solely belongs to you. Here are some useful tips on how to build a go kart frame. Sit down on a piece of cardboard and start sketching your own design for the go kart frame. Be sure that you can fit the driver (in this case, yourself) in the frame comfortably. Most of the time, the frames come in ovals or squares. The wider the wheel base is, the more stable the go kart will be. Based on your design, roughly estimate the amount of materials and tools that you will need for the entire project – welder, pipe bender, metal tubing, filler materials etc. It is important to go for tubing that is light in weight but sturdy enough to withstand the pressure and speed of your go kart. First, cut the tubing material with a chop saw or hack saw according to the accurate measurements and drill holes to connect the tubing together to form a frame. You may use tools like bolts, screws or a welder to connect them into a frame. It would be best for you to consult a professional welder or let them do this part of building because the task can be dangerous to novice builders. You may want to use plywood for the interior of the go kart. Cut out plywood of the appropriate size to fit into the tubing frame as the flooring. Use the extra plywood pieces to cover up the inner sides of the go kart. 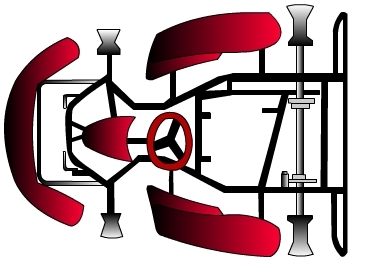 When you are done with the frame, you may proceed to add on the other parts of the go kart frame. For instance, the engine frame, the car seat, steering and bearing kits, as well as wheels. Normally the go karts are about 2 inches off the ground and bear in mind that the lower your go kart is, the more stable it will be. It reduces the chance of flipping over as the centre of gravity is high enough to prevent that from happening. That is generally how to build a go kart frame. In order to complete a go kart, you will need to install the engine and car seats, as well as the brakes, steering and wheels.